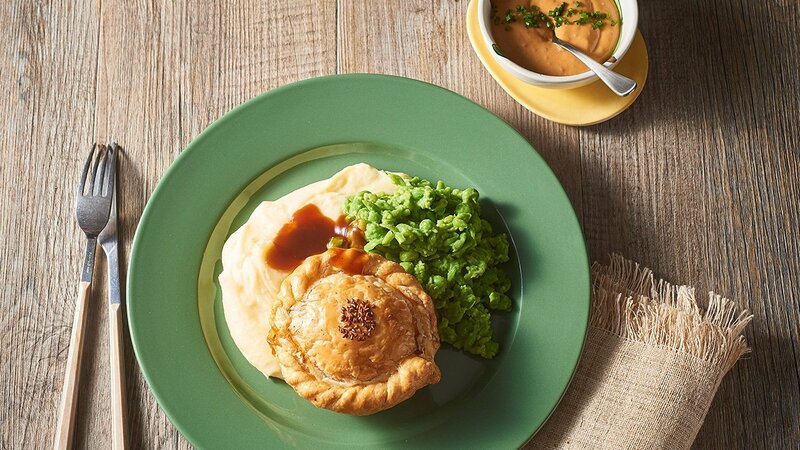 Satay chicken is a must have - so we have wrapped it in pastry to create a pie, served with peas and creamy mash. Always a crowd pleaser, try it on your menu today. Add in onions and cook until soft. Once soft add in chicken. Stir and cook for around 10-15 minutes. In a medium bowl mix - KNORR Coconut Milk Powder, KNORR Malaysian Satay Sauce GF and water. Add wet mix into the pan and simmer until thick. Once thick - remove from heat and set aside ready to use. Take the sheets of short crust pastry and cut into 4 equal squares. Using spray oil, spray the pie tins and place each square of pastry into a prepared tin. Mould to form the base of the pie. Using the satay chicken mix, fill the pastry base ready to add the lid. Take the puff pastry sheets and cut into 4 equal squares. Place one square on top of each pie base. Pinch around the top of each pie and trim extra pastry. Roll and fold edges ready to brush. Take one egg and add a little milk to make an egg wash. Use wash to brush the top of each pie and then sprinkle with sesame seeds. Place in the oven at 180 degree Celsius for around 15-20 minutes. KNORR Instant Sweet Potato Mash and crushed green peas.